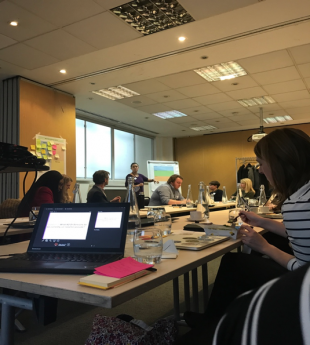 On 26 January GDS and UK Visas and Immigration jointly hosted an interactive ‘show and share’ event to share best practice on digital inclusion and developing assisted digital services. The interactive workshop, held in London, included visitors from the Home Office, Northern Ireland office, Ministry of Justice, NHS Digital and the Department for Work and Pensions. how can the Digital Training and Support Framework support this work? what can cross-government research tell us about assisted digital user needs and digital inclusion? which assisted digital and digital inclusion services do we provide now, and which should we provide in future? which commercial tools have been used to effectively procure assisted digital and digital inclusion services? can we provide these services to users jointly across government - if so, how? In a successful workshop we found that assisted digital user needs are very similar across government, so there are opportunities for departments to work together on services that meet these needs. We agreed to establish an ongoing quarterly board to share best practice and continue our collaboration. I am thankful to everyone who came and made the event such a success. To learn more about assisted digital, digital inclusion or the Digital Training and Support Framework, you can contact the Assisted Digital Collaboration Network at ad-di.collaboration.board@digital.cabinet-office.gov.uk. Read more on the assisted digital blog.